Thanks to this contract, which will inject capital into the project, the HPT team, made up of professionals from SENER and UC3M, will develop an engineering model to certify the system prior to its in-flight demonstration, which could take place in 2022. To date, SENER and the UC3M have manufactured a prototype of the helicon plasma thruster, which was firstly ignited in 2015 at the Electric Propulsion Laboratory premises of the ESA. After this first start up, the system design has evolved and several updated prototypes have been tested at the UC3M facilities, which will be reflected in this new engineering model that SENER and the UC3M are already developing, thanks to the ESA contract. 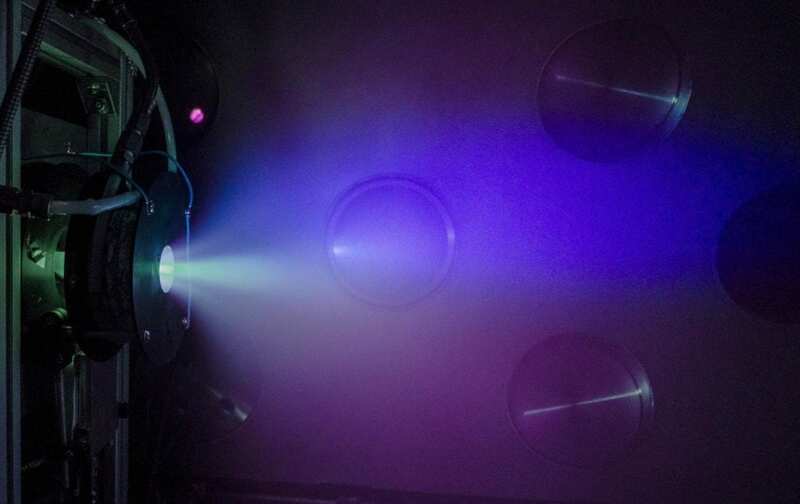 The helicon plasma thruster is an innovative technology for electric in-Space propulsion that could be a competitive alternative to the current thruster technologies and therefore awakes the interest of several companies and institutions, including ESA. The helicon plasma thruster is constituted by an antenna that emits radiofrequency waves in a cylindrical chamber where a hot plasma is generated and a divergent Magnetic Nozzle, where the plasma is supersonically accelerated. This device has no grids, electrodes or solid nozzles, which introduces great improvements in terms of simplicity of operation and extended lifetime. At the same time, the HTP is expected to provide high thrust-to-power ratio per unit than other electric propulsion systems, like ion thrusters and Hall motors, reducing travel times. Therefore, these kind of thrusters can provide optimum levels of propulsion performance for certain space missions, especially full electric spacecrafts. Given current trends, which are headed toward this type of vehicle, a wide range of missions could benefit from this new technology: in the short term, telecommunications satellites in geostationary orbits, as well as satellites in low-Earth orbit and constellations in medium Earth orbit. And, in the future, higher-power versions of the HPT could be used on manned missions to Mars, orbiting service platforms (like the Space Tug project) or payload vehicles between Earth and the Moon, as well as future programs to remove space debris or refuel in space. SENER is a private engineering and technology business group founded in 1956. Its aim is to offer its clients the most advanced technological solutions and to achieve international recognition based on its independence and commitment to innovation and quality. SENER has more than 2,500 professionals across its centres in Algeria, Argentina, Brazil, South Korea, Canada, Colombia, Chile, China, the United Arab Emirates, Spain, the United States, Morocco, Mexico, Poland, Portugal, the United Kingdom and South Africa. The group's operating revenue exceeded 766 million Euros (2017 data). SENER brings together its own Aerospace and Engineering and Construction activities with industrial holdings in companies working in the field of Energy & Environment. In Aerospace, SENER has more than 50 years of experience and it is a first-rate international supplier in Space, Defense and Aeronautics. In Engineering and Construction, SENER has become a leading company worldwide in the Infrastructure and Transport; Renewables, Power, Oil & Gas; and Marine sectors. UC3M is an innovative public university that is committed to improving society through cutting-edge research and high-quality education, in keeping with the most rigorous international guidelines. It is the first Spanish university and 22nd in the world in the QS ranking of the best 50 universities in the world that are under 50 years old, and it is featured in THE World University Rankings. It also leads the mobility ranking for students in the Erasmus+ program.